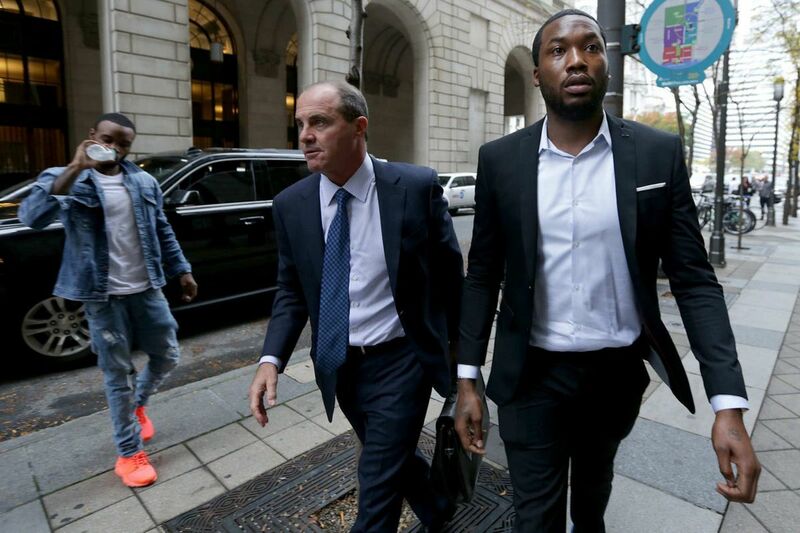 Rapper Meek Mill, right, arrives the Criminal Justice Center with his lawyer Brian McMonagle, center, in Philadelphia, PA on November 6, 2017. My office, the Defender Association of Philadelphia, does not represent Meek Mill. However, my office does represent over 10,000 people a year in probation violation hearings. The people we represent in these hearings aren't famous. I am most concerned about what happens to our clients, the regular people of Philadelphia, when no one is watching. While probation has its value when used appropriately, it shouldn't be used to micromanage people. Rather, it should be used to ensure individuals have the tools and assistance needed to rebuild their lives within the community. After all, whether incarcerated or not, when court supervision ends, people are on their own. The period of probation must be used to build upon strengths, not prey upon weaknesses. People have a common misperception that once a person is guilty of a crime and placed on probation, he or she forfeits all rights. This mindset is one of the core problems that keeps people trapped in a cycle of incarceration. While no one has a right to be given probation, once placed on probation, you have a number of protected rights. As the U.S. Supreme Court stated in 1932, "[w]hile probation is a matter of grace, the probationer is entitled to fair treatment, and is not to be made the victim of whim or caprice." Under the law, the simple fact of a violation is not enough to send someone to prison. Rather, if a violation is proven, there is a second inquiry courts must undertake. That question, as stated by the U.S. Supreme Court, is "should the [person on probation or parole] be recommitted to prison or should other steps be taken to protect society and improve chances of rehabilitation." To make this determination, a judge must find that the person's violation shows that "probation has proven to [be] an ineffective vehicle to accomplish rehabilitation and not sufficient to deter against future antisocial conduct." This second requirement is often overlooked. Meek Mill may not be the perfect person, but this is the perfect time to talk about the problem his case has amplified. Many people think Meek Mill, or individuals in a similar position, "deserve" to be sent to prison. Perhaps some think the purpose of putting human beings in jail cells for multiple years is to teach them a lesson. But understand that this is how mass incarceration perpetuates itself, and to justify these sorts of sentences is to embrace the very problem of hypersurveillance and erosions of personal liberty. Through this case, the public can see how easy it is to have technical rule violations land people in prison. And the cost is borne not just by the person incarcerated, but by the communities, families, and the taxpayers of Pennsylvania. Incarceration of those who violate probation and parole comes with a hefty price tag, costing Pennsylvania taxpayers approximately $420 million per year. With 45,000 people on probation in Philadelphia alone, and thousands more on state parole, the net of correctional supervision continues to ensnare more people. And when probation lasts too long, violations are almost guaranteed. Statewide, the average length of probation for all offenses is 18.5 months. Philadelphia has the longest average probation length of any county in the state, and is nearly double the state average at 35.3 months. With a litany of strict conditions and restrictions, it is inevitable that someone will make a mistake over a five- or 10-year period. We need to reconsider the length of probation. After all, the evidence shows that most people who commit a new crime while on probation will do so in the first year or two. Instead of expecting everyone to be perfect, we need to return our focus to what matters: helping people improve their lives while remaining crime-free. On any given day in Philadelphia courts, hundreds of probation violation hearings take place with no one other than a defender standing by their side. Prison sentences for technical violations are handed out daily — a regular occurrence that goes unnoticed by the public. Probation should be a road to a better life, not a pathway to incarceration and an endless cycle of desperation. To reverse mass incarceration, we need to think and act differently if we are to expect different results. Keir Bradford-Grey is chief defender, Defender Association of Philadelphia.